Links to JAPANESE Anti-Smoking Groups! This sign is displayed in the duty-free area of Korea's Inchon International Airport! WE OWE A LOT TO THIS MAN! This hero ex-Brown & Williamson executive (played by Russell Crowe in the movie "The Insider") risked threats to his children to bravely expose the truth by submitting documents which proved that the "Seven Dwarfs" (the seven big tobacco companies) had lied under oath to the US Congress about knowing tobacco IS addictive! 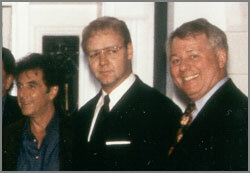 Jeffrey Wigand with "The Insider" cast members Al Pacino (left) and Russell Crowe (center). NO SMOKE TOKYO is a non-smokers association in Tokyo whose agenda is to increase the number of non-smoking areas throughout the city with special attention to increasing smoke-free restaurants, bars and other places of relaxation and entertainment, because tolerating a polluted indoor environment for "enjoyment" doesn't make sense. Have you returned home from an evening out for a "good time" only to face yourself with eyes red from the smoke pollution and your clothes and hair covered with a stinky layer of nicotine? If you feel as we do, please join us at our events to support a smoke free environment for everyone. We are a non-profit group of Tokyo residents and we welcome your involvement. Thank you all, and have a happy smoke-free day!!! Announcements are sent approximately every 1-2 months. permission of No Smoke Tokyo. accessibility of any links on our pages.